the heavily strapped scary looking policeman! Didn't catch the right moment but he looked like he meant biniss. In plain sight too of the tv cameras. I thought usually the security was in the back, out of view. Ok, that was all I had. He heard there was a killer forehand on the court. Can you watch this match online? What was that argument that he had with the guy in the crowd about? The courtside mic picked it up, he said to JMDP: "You only won a slam because of the weak era!" His knee is still problematic? Switch camera to a basement in the rural parts of northwestern Europe, where I am very slowly clapping my hands. This is strange; was there a rumoured threat or something or is that some new contribution to the development of tennis as a spectators' sport in the USA? Is that normal for any other sport there? Yeah this was a bit weird. @Red Rick can't be mad at Delpo anymore. He felled Opelka. Isn't it better, when it is someone who is good at what he does? A kind of like how the rich paid to experienced executioners to severe them with one blow, so that they don't suffer. Nah, Roddick winning matches was always better than him losing matches. I always thought it would be kinda cool if he played his last match vs Fed, but he landed in Djoko's quarter. Andy already had received his farewell present from Federer by that time, so I thought that falling to him again in the end would have been a "lesser" (for their rivalry) way to go. I think he said something about his mother! Terrible but true. Embrace it, face it, live it. Brazil is now under a new, much 'tougher' President. Jair Bolsonaro is their equivalent to Trump. It's also a hella dangerous country. So it could either be aggressive posturing by the new regime. Or simply good business. 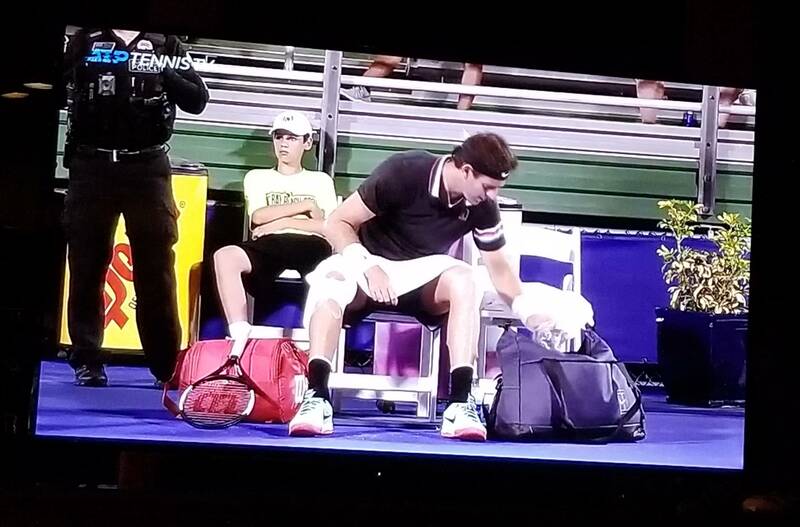 I think there was some psycho threatening Delpo before the match. probably some crazy anti argentine nutcake ?? Nice! At Cinci, you see cops walking the grounds but never on court like this so it stood out to me. I've been to a few Challengers as well and it was the same. Perhaps like you said, it could be this tournament specific due to seating. to keep us safe from the treacherous Banksters plans.